Most people view ActiveCampaign as a marketing tool. But the software is actually much more versatile. Here are three more ways to use it that you may not have thought of. You’re using ActiveCampaign as part of your marketing efforts. That means you know how much its automation features help you to appeal to clients. With it, you’re able to send personalized emails to leads based on where they are in your marketing funnel. The software makes it easy to create email templates that pull in customer data for a more personalized feel. Naturally, most people use the software for their email marketing campaigns. They get to save time while staying in touch with current or potential customers. And ActiveCampaign is very effective in this role. But what you may not know is that the software has potential in other areas. It’s not just a marketing tool. It’s something that you can use in a variety of ways to interact with customers beyond just sending marketing materials. In this article, we’re going to look at three other uses for ActiveCampaign. Each of these can help you to build stronger relationships with your clients via the software’s automation. The onboarding process differs depending on if you’re onboarding new clients or employees. With clients, your aim is to inform them about your products and services. You’re looking to tell them what you have to offer so they have the information needed to make decisions. With employees, you’re aiming to familiarise them with how your business operates. A good onboarding process helps an employee slot right into their role. In each case, you’re creating an introduction that helps another person understand more about the business. ActiveCampaign provides you with the ability to automate the onboarding process. Better yet, you can do this for both clients and employees. Create a New Automation from the Automations Overview page. This opens a recipe modal. Click on “Start from Scratch” then continue on. Select your Trigger. Your chosen Trigger determines which clients enter the onboarding process. For example, you could set a “New Purchase” tag to each first-time customer. This would require you to use the “Tag is Added” trigger. There are different triggers that apply based on Goals and other Deep Data integrations. Let’s assume you’ve created a “New Purchase” tag and selected “Tag is Added”. A Trigger modal opens. From here, you can enter the Tag that you want the Trigger to look for. You can also choose how often the Trigger runs per new contact. There are other options that allow you to limit which clients enter the onboarding process. From there, you can adjust your automation based on your desired onboarding process. With Sarah’s method, you create an onboarding process that allows you to maintain communication with each new purchaser. You can dig deeper to provide materials based on the purchase the user makes. The key is that you use ActiveCampaign to onboard them, thus strengthening the relationship. Jordan Skole of Ventures and Adventures applies a twist to this technique. Instead of using ActiveCampaign to onboard clients, he uses it for employees. Requirements: This stage caters for the delivery of requirements-based materials. This may include policy and legal requirements. You can use ActiveCampaign to automate the sending of these documents to a new hire. The employee can then sign and send them back. Infrastructure. This is when you’re preparing everything the new hire needs to get started with the company. Jordan uses ActiveCampaign to send emails to all necessary departments. They can then create the needed infrastructure. For example, an automated email may go to the IT department for a new computer. Another may go to the building manager to get a building pass for the new hire. Orientation. All employees go through this, which covers the first day on the job. You can use ActiveCampaign to automate the sending of schedules to new hires. Training. This often involves sending materials to the new hire, again via email. You may automate this process using ActiveCampaign. Plus, you could use the software to align your training team to carry out any in-person training. Assessment. This can take the form of follow-up emails and surveys that the new hire can respond to. Using ActiveCampaign allows you to automate large portions of these onboarding stages. Again, Jordan can make good use of tags and triggers to determine when to send his onboarding messages. You may operate a members-only portion of a website. In these cases, you likely have exclusive content to deliver solely to your members. ActiveCampaign can help with this. Matt Fox of Friction Free Sales uses ActiveCampaign for this service. He operates a WooCommerce-based website. It uses ActiveCampaign to provide users with access to different download information. He uses tags to deliver this content based on what people purchase. For example, when someone makes a purchase, a tag gets applied. This grants the buyer access to a piece of information related to that purchase. Often, this is an upselling opportunity for Matt. He applies a time to this tag, which means it gets deleted within an hour. After that, the buyer can no longer access the page. This allows Matt to provide limited time only content to certain users of his website. You could extend this basic concept out to provide access to content based on other tags. For example, you could use Bronze, Silver, and Gold tags to denote membership levels. You could then use ActiveCampaign to deliver content based on those tags. You can find out more about using ActiveCampaign to build a membership site on our blog. 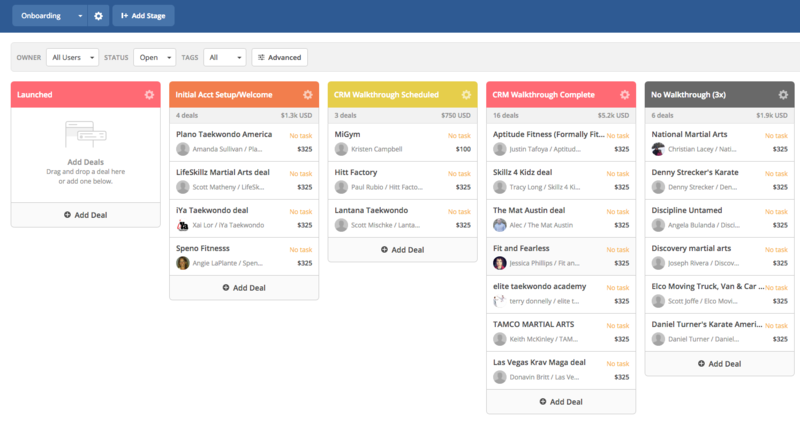 ActiveCampaign’s deal pipelines allow you to apply agile principles to your sales efforts. This stretches beyond the basic automated marketing emails. It also deals with how you nurture your customers through your sales funnel. Digital ventures company Venture Harbour offers some insight into how this works. When you build a sales funnel using ActiveCampaign, the software prompts you to break the funnel into stages. This allowed the Venture Harbour team to visualise the steps that a prospect takes before turning into a sale. This is a deal pipeline. Yours may have different stages, but the general concept is the same. Venture Harbour also has several customer types, which means it doesn’t make sense to use a single deal pipeline for all of them. They use ActiveCampaign to create several pipelines, each of which has its own stages depending on the customer type. You can create as many deal pipelines as you like using ActiveCampaign. This allows you to account for all customer types that your business has. ActiveCampaign also allows you to assign specific tasks to different customer types based on where they are in the pipeline. Plus, you can assign different deals to employees. Finally, you can score leads based on your own criteria. These scores can determine where in the pipeline the customer is. This makes setting and achieving Key Performance Indicators easier. Venture Harbour’s use of ActiveCampaign demonstrates that you can use deal pipelines to manage the customer journey. You can also create deal pipelines to help with project management or internal recruitment. As you can see, ActiveCampaign offers much more than marketing automation. Clever use of the software helps you to shore up business processes and enhance customer relationships. It’s not just a way to automate initial communications with customers. You can use it to enhance relationships and help with issues like onboarding. The use of tags also allows you to restrict content delivery based on certain criteria. This proves particularly useful if your website has a members-only area. It also helps you to deliver specific content to people who’ve taken desired actions, as Matt Fox does. The point is that ActiveCampaign is more versatile than you may realize. Here’s the best part. Automation Agency can help you to put all of these techniques into practice. Just send in a task to get started. There are also many more ways to use ActiveCampaign beyond marketing. Just download our Outsourced Task Ideas for ActiveCampaign Users to learn more. Not currently using ActiveCampaign? Head to the ActiveCampaign website to learn more about the platform and how you can use it to automate in several areas. Or maybe you’re unsure if Automation Agency is the right fit for your business? Chat to our Facebook Messenger chatbot to find out if we can help you.